From today’s Ventura (CA) County Star. FGBC incoming moderator John McIntosh is pastor of the Simi Valley church, which sponsors the school. Students and faculty from Grace Brethren Elementary School, with Principal Howard Lee at far right, accept a $2,500 check as the top finisher in Simi Valley Town Center’s third-annual Shopping for Students program. 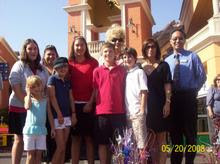 Students and faculty from Grace Brethren Elementary School in Simi Valley were awarded a $2,500 check May 20 from Simi Valley Town Center, as the top participant in the regional shopping center’s third-annual Shopping for Students program. Vista Fundamental School placed second and earned a $2,000 prize, while Hollow Hills Fundamental School claimed third and $1,500. All told, Simi Valley Town Center donated $40,500 to 25 schools from Simi Valley and Moorpark in a contest that began at the start of the school year. Schools receive five points for every dollar spent according to receipts submitted through April 30, and every school received at least $250. Grace Brethren earned 1,812,940 points; it also won the contest in 2007.